I'm a sucker for anything that has full coverage and concealer in the same sentence. So when IT Cosmetics became available on QVC UK, I preordered right away. 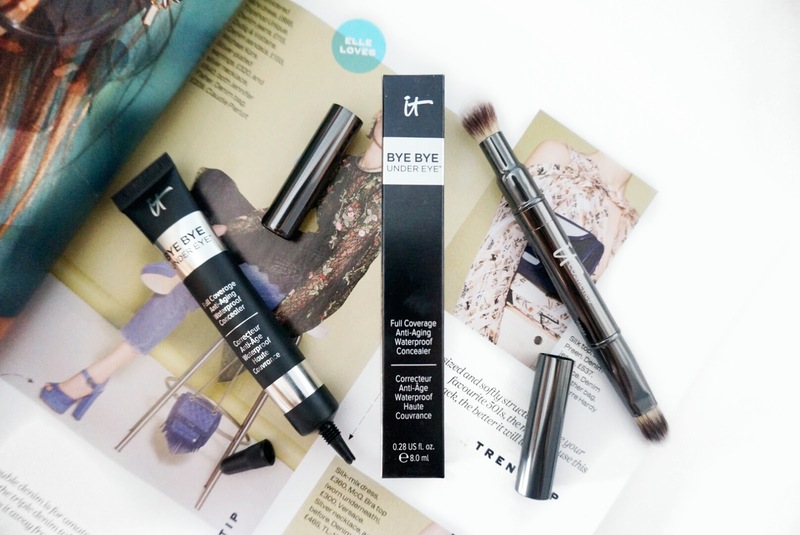 There are so many rave reviews on the brand It Cosmetics but the Bye Bye Undereye is definitely the product that got me interested. I love all concealers to combat my dark circles and sometimes have difficulty finding a good heavy duty concealer that is not cakey. 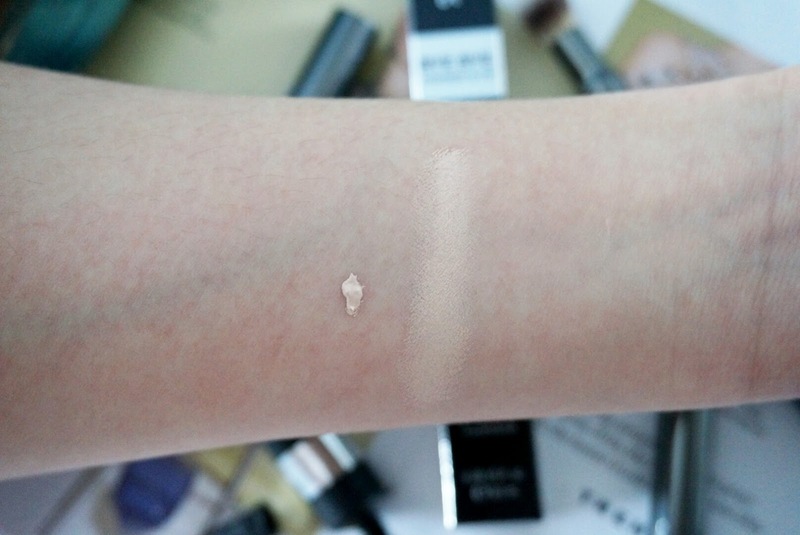 I've experimented with a range of undereye concealers which I reviewed here. You receive 8 grammes of products in a plastic squeezy tube with a screw on lid. It is sold on QVC as a set with the It Cosmetics concealer brush for £23.64. I find it difficult to squeeze the product out as the consistency is thick. It is a travel-friendly size. The brush sold in the set is soft but I don't use it, I find it difficult to wash and dry. The It Cosmetics Bye Bye Undereye is a highly pigmented full coverage concealer with anti-aging ingredients that helps treat the appearance of fine lines, wrinkles and discolouration. It also claims to be crease resistant and waterproof. The concealer has a thick consistency, therefore a little goes a long way. I squeeze out a dot for each undereye area to use. It's better to use less to prevent a 'cakey' look. The finish is dewy therefore you do need to set it to prevent creasing (I am currently using the RCMA No Color Powder). I currently have the shade Medium (or known as a neutral medium) which is the second shade in the range. I originally bought Light which is the swatch that you can see. You can clearly see that this is way too light for me even though I like that 'highlighted' look to make me appear more awake. For reference, I am an NC 25 in MAC and W3 in Loreal Paris True Match Foundation. Medium is almost the same shade as my skin tone with a peachy undertone and I do think they need a shade in between. There are 4 shades altogether. I've experimented with many different methods using this concealer to see what I prefer. (Which is what is written on the box) Using the It Cosmetics concealer brush and apply sparingly using feather light strokes. Warm on the back of your hand so the consistency melts and will be easier to move the product around, pat the concealer onto your eye area with your fingertips gently and apply where needed. Apply with a flat concealer brush directly and blend with a damp beauty blender. I've used all the methods and I have been jumping between Method 2 and 3. I find that Method 1 leaves brush strokes since the product is quite thick and is not easy to buff out. Method 2 and 3 are the longer lasting methods since you push the product onto your eye area. Method 3 is perfect if you have a dry under eye area as the damp beauty blender helps restore some moisture. I find that the It Cosmetics Concealer only covers approximately 80% of my dark circles, if I want a 100% full coverage I do layer the Ardere Cosmetics Concealer and Colour Correct Underneath. As mentioned before the colour is not perfect for me as I like concealer to make me look more awake therefore I use the Ardere Cosmetics Flawless Concealer in shade 2 to provide me with that. Will I continue to Repurchase? Yes. Do I recommend this concealer to everyone? Yes and No. If you have dry under eyes which I sometimes get, you might find that this concealer absorbs some of the moisture under your eyes, therefore, you need to prime well with your skincare. I don't see any improvements in terms of skin care benefits that are mentioned such as reducing fine lines or plumping . I have a stubborn line on my right eye area and some fine lines on my left eye area which all concealers settle into them so this concealer makes this one no different but it does help diminish the purple-blue tones under my eyes. Another point is that this is a heavy duty, so beginners need to take time and blend since it's not an easy task and takes some time. It takes the same time I do my brows and that's a good 5 minutes including setting the concealer. If you set your concealer well it can easily last you 10 hours which is what my normal wear time for my make-up is. I find the applicator difficult to use since the product is hard to squeeze out but the coverage is one of the best I have tried so far. So there are pros and cons for this concealer. QVC has a 30-day return policy even though you have used the product. I returned the light shade and now own the medium. So if you want to try this out you can and we can experience returning used makeup that we don't like back to the retailer like America. It Cosmetics has also recently been bought by Loreal Paris, so I think we will be seeing a lot more of It Cosmetics especially on the high street in the future. That is all for this post! Don't forget to check out my 8 Undereye Concealer's That I have Tried and Tested post for more concealer reviews. Fantastic review! I love IT Cosmetics Bye Bye Undereye and top it with their celebration foundation from b-glowing.